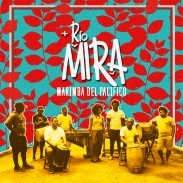 The Smithsonian Folklife Festival, in partnership with Multiflora Productions, presents a performance of marimba del Pacífico by Río Mira Thursday, Oct. 11, at 7:30 p.m. at the Tropicalia Lounge in Washington, D.C. The performance is the first event in advance of the 2019 Smithsonian Folklife Festival: The Social Power of Music and is part of Multiflora Productions’ “Flash of the Spirit” global music festival. Tickets are $20 and can be purchased from the Folklife Festival’s website. The marimba music of South Pacific Colombia and Esmeraldas Province, Ecuador, traces back to communities formed by escaped enslaved Africans, or maroons, and indigenous peoples of the region. In 2015, UNESCO recognized their marimba music as intangible cultural heritage. In 2014, musicians Larri Preciado and Esteban Copete joined singer Karla Kanora to form the musical collaboration Río Mira. The group, which takes its name from a river that runs from Ecuador into Colombia, is guided by the distinctive percussive tones of the marimba, a chonta palm xylophone. In 2019, the Smithsonian Folklife Festival takes as it animating theme “the social power of music.” Featured programs on Benin, Brazil and Washington, D.C., along with smaller case studies that include Armenia, the Baltic states and others will demonstrate the ways music bonds, bridges and challenges. Through workshops, master classes, panel discussions and performances, the public—on-site and across digital platforms—will be encouraged to play instruments, join pop-up choirs, participate in social dances and share stories about the ways in which music connects people to the larger world. The Smithsonian Folklife Festival, inaugurated in 1967, honors contemporary cultural traditions and celebrates those who practice and sustain them. Produced annually by the Smithsonian’s Center for Folklife and Cultural Heritage in partnership with the National Park Service, the Festival has featured participants from all 50 states and more than 100 countries. Follow the Festival on Facebook, Twitter, Instagram and YouTube. Flash of the Spirit is Multiflora Productions annual monthlong do-it-yourself global music festival that happens across multiple venues with partners in the arts in Washington, D.C., during the month of October. Its mission is to present emerging and remarkable international musicians from abroad as well as local musicians from diverse immigrant communities to celebrate their stories, heritage and cultures through their music.